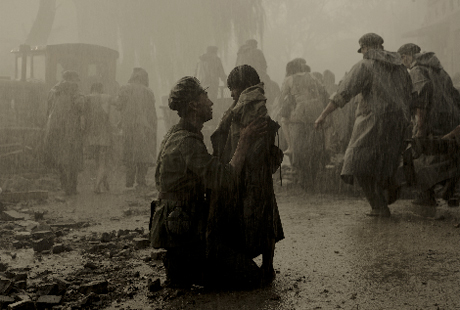 Opening and closing with the devastating earthquake of Tangshan in 1976 and the more recent 2008 Sichuan earthquake, Aftershock has the gravity of Chinese cultural significance, commemorating the lives of over 300,000 victims. Based on the Chinese-Canadian author Zhang Ling's novel, this story of a family destroyed by these events tries to tie together the disasters thematically, acknowledging turning points in the lives of all involved, to melodramatic and dreadfully strained effect. Initially, the film is set up in part as an allegory for the cultural preference of male children in China, even before the introduction of the one-child policy, with a mother (Fan Xu) repeatedly giving her son preference over her daughter. Following the Tangshan earthquake, she's forced into a Sophie's Choice scenario with her children when they are pinned beneath separate ends of a beam. Tearfully choosing her son, things become problematic when the daughter survives. Now, this set up actually opens the door to some interesting potential family conflict and dramatic tension, especially considering the incidental death of the father figure in a male-dominated culture. Unfortunately, these subtleties are lost somewhere in between the many jumps ahead in time, with the daughter, Fang Deng (Jingchu Zhang), settling into her adopted life with another family. Aside from her internal conflict — she becomes pregnant with an unwanted child while away at school — most of the film spans incidental and tiresome sequences of the mother mourning her past while her one-armed son tries to help her move on. Anytime anything remotely emotional happens everyone screams and falls to the ground in such a way that it's nearly impossible to take their plight seriously, or the movie, which bounces from one scene to another with little continuity or grace.